A year ago, the news of the biggest-ever catastrophe at a Russian hydropower facility rocked the country. 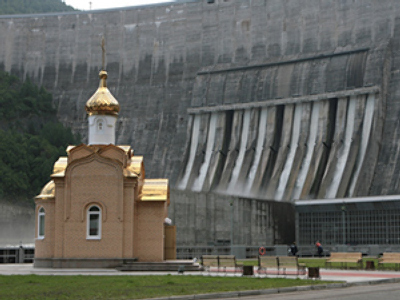 The Sayano-Shushenskaya hydropower plant on the Yenisey River in Siberia is the largest in Russia and the fourth-largest in the world. With an installed capacity of 6.4 million kilowatts, it was producing 22.8 billion kilowatt-hours annually (for comparison, an average large electric power plant produces 1 billion kilowatt-hours per year). At 04:15 Moscow time on August 17, 2009, one of its hydraulic units suddenly collapsed, and a massive surge of water from the shaft submerged the machine room, as well as the premises beneath it, destroying everything in its path. At the moment of the accident, nine out of the plant’s ten hydraulic units were working. All of them were quickly submerged in the water and short circuited, which led to the blackout of the entire station. As a result the automatic systems, which should have stopped the hydraulic units and closed the valves, did not activate. Even though the valves were eventually closed manually an hour later, water had already destroyed three of the plants hydraulic units and damaged another seven. A rescue operation started immediately following the catastrophe, but during the next day only two people were found alive. After that, the chance of finding survivors was estimated as “minor” by emergency services. The accident claimed the lives of 75 people and injured another 13. The body of the last missing worker was recovered on September 23. Both RusHydro – the company that owns the station – and the Russian government have paid compensation to the families of those killed in the accident. Each of the families received one million roubles from RusHydro (about $32,000), plus the employee’s two-month salary, and were allocated money for funerals. The federal government has also given each family 1.1 million roubles. A criminal case into the accident has been launched and the investigation is still underway. As of now, Russia’s Investigative Committee of the General Prosecutor’s Office has fully dismissed the “water hammer” version, as well as the version of a terrorist act at the station. Meanwhile, right after the accident, two commissions were set up specially to investigate the technical causes of the breakdown, and they have already published their reports. The commission organized by Russia’s industrial safety watchdog Rostechnadzor concluded that organizational problems, negligence and equipment failure were the main causes of the catastrophe. The economic damage from the wreckage of major power generating assets caused by the accident exceeded 7 billion roubles (approximately $230 million). One of the station’s hydraulic units was restarted on February 24, 2010, but full reconstruction of the hydropower plant is expected to take up to four years and will not be completed earlier than 2014, at an estimated cost of over $1 billion.